The Middle Tennessee State University Pep Band rode their 30 win basketball season into the NCAA Tournament today and took down the Minnesota Gophers to advance to the Round of 32. Sitting with the pep band was a regular guest star, Eli Deml. 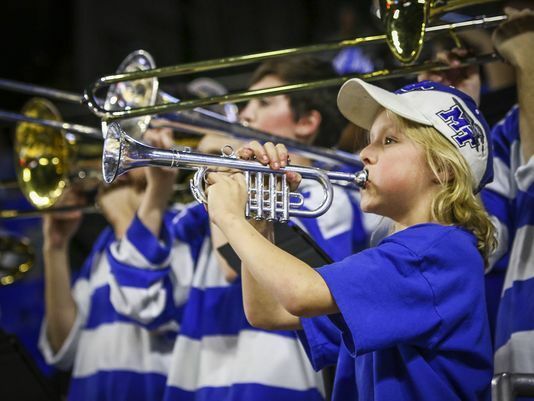 Deml is a 10-year-old high functioning autistic super fan of the MTSU pep band. Throughout the season he has sat in with the band at games and even has pregame rituals with some of the players. "Eli just started gravitating towards us at the basketball games,” pep band director Allen Kennedy told the Daily News Journal. “The pep band members, they’ve really allowed him to open up and sing along. Deml plays a toy trumpet with the band and his parents have supported his love for the pep band every step of the way. They took him to the Conference USA Tournament and even made it to today's NCAA first round game. We hope one day that Eli gets to live his dream and joins the band as a college student. Keep it going little man! !